This domain represents the N terminal domain in chitobiases and beta-hexosaminidases EC:3.2.1.52. 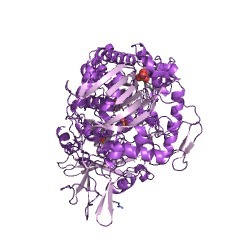 It is composed of a beta sandwich structure that is similar in structure to the cellulose binding domain of cellulase from Cellulomonas fimi (PUBMED:8673609). This suggests that this may be a carbohydrate binding domain. This domain is found in the N terminus of chitobiases and beta-hexosaminidases. It is composed of a beta sandwich structure that is similar in structure to the cellulose binding domain of cellulase from Cellulomonas fimi [(PUBMED:8673609)], suggesting that it may function as a carbohydrate-binding domain. There are 1494 CHB_HEX domains in 1480 proteins in SMART's nrdb database. Taxonomic distribution of proteins containing CHB_HEX domain. This tree includes only several representative species. The complete taxonomic breakdown of all proteins with CHB_HEX domain is also avaliable. Click on the protein counts, or double click on taxonomic names to display all proteins containing CHB_HEX domain in the selected taxonomic class. Bacterial chitobiase structure provides insight into catalytic mechanismand the basis of Tay-Sachs disease. Chitin, the second most abundant polysaccharide on earth, is degraded bychitinases and chitobiases. The structure of Serratia marcescenschitobiase has been refined at 1.9 A resolution. 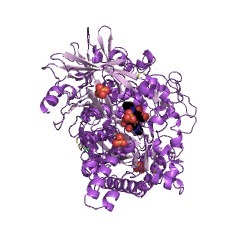 The mature protein isfolded into four domains and its active site is situated at the C-terminalend of the central (beta alpha)8-barrel. Based on the structure of thecomplex with the substrate disaccharide chitobiose, we propose anacid-base reaction mechanism, in which only one protein carboxylate actsas catalytic acid, while the nucleophile is the polar acetamido group ofthe sugar in a substrate-assisted reaction. The structural data lead tothe hypothesis that the reaction proceeds with retention of anomericconfiguration. The structure allows us to model the catalytic domain ofthe homologous hexosaminidases to give a structural rationale topathogenic mutations that underlie Tay-Sachs and Sandhoff disease.